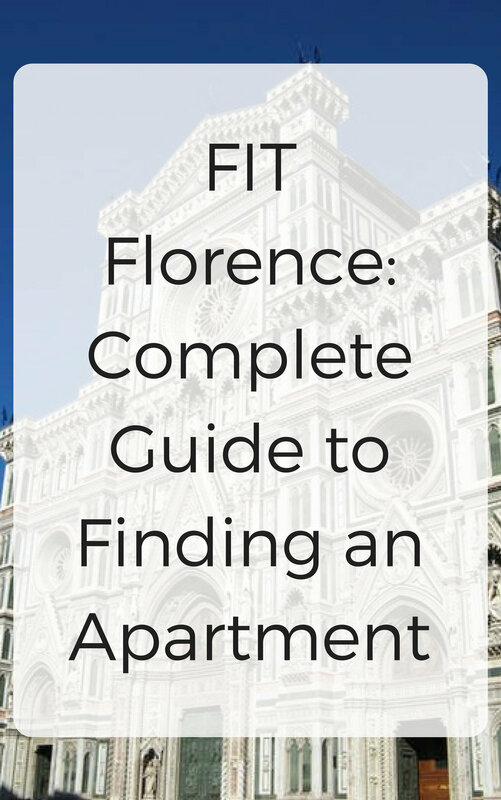 Finding an apartment in Florence is the #1 most nerve-wracking thing about the FIT Italy study-abroad program. Since there is no student housing in Florence, you have to find an apartment on your own, and that can be scary! Especially having to to it in under 3 days! But don't get freaked out, it will all be okay! Many have done it before you, and there is a simple process that will get you a great apartment! Here is step by step what you will do, and some tips to make it easier! During the first day of orientation, reps from several agencies in Florence will come and present you with a list of available apartments. Each on will list bedrooms, bathrooms, address, and a few other amenities. 1. The Duomo - center of the city, close to pretty much everything, and you'll get to walk past iconic landmarks everyday. However, very busy and loud with tourists. 2. Santa Maria Novella - this is the neighborhood surrounding Florence's train station, so it's a great place to be if you're trying to jet off every weekend! Downside, think of it like living next to Penn Station or La Guardia, loud and busy, but convenient to both trains and school! 3. Santa Croce - the East Village of Florence, very trendy and tons of great nightlife! (plus there's an awesome Christmas market all of December!) A little farther from school than Santa Maria Novella, but worth the walk in my opinion! 4. Oltrarno & San Niccolo - (called Palazzo Pitti on map) Across the Arno river from the center of Florence, it's basically the Williamsburg of Florence. Trendy, tons of great restaurants, close to the Boboli Gardens and Piazza Santo Spirito (which has Gusta Pizza and amazing aperitivo spots). I lived in Oltrarno, so I'm biased when I say it's the best, but give this less touristy neighborhood a look! Budget: Stick to it - and don't budge. If you start looking with a group who wants to pay $700 a month, and your budget is $500, go find someone else!! I geuruntee there is someone else looking for a place at the same price as you. Expectations - You'll have to lower them quite a bit. By this, I mean that 95% of apartments in Florence will not have central air, a microwave, or other modern conveniences that NYC apartments do. They also look like they were decorated by grandmas, it's all part of the experience! Know when FIT ITALY posts go up! Get the posts in your inbox, and access to FREE FIT ITALY packing checklists! Once you've got a list of the places you'd like to see, look at the times they have open houses (some of them you might have to go to the agency and request a viewing) and map out a route to take! TIP: Wear running sneakers, a sundress, and bring lots of bottled water and sunscreen! We walked 14 miles in 102 degree heat that day!! You'll live alone. And while I love living alone in NYC, living with roommates while abroad is definitely better! Overall, I personally wouldn't do it, since you'll miss out on the study abroad experience of living with roommates in a little Italian apartment, and learning to make coffee in a Moka while the lady next door sings opera at 9 AM. Those are some of my favorite memories, and they couldn't have happened in a dorm/hotel! Leave any questions / post suggestions in the comments below!